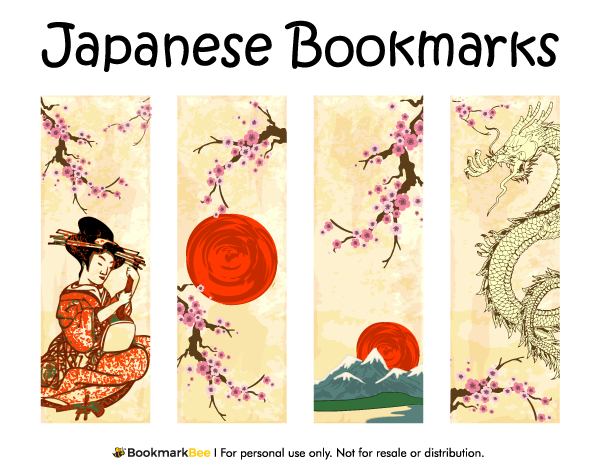 Get All of Our Bookmarks - No Watermark! Our bookmark bundle includes all of our bookmarks without the watermark for only $9.99. There are also two bonuses available exclusively in the bundle: 26 alphabet bookmarks and 40 bookmarks to color. Japanese-style art with a woman, cherry blossoms, a dragon, and more. Download a free version of this bookmark below. Note that the free version includes a watermark on each bookmark, but we do offer a bundle of all bookmarks without the watermark. Download the PDF file for the bookmarks. Open the file in a PDF reader such as Adobe Reader. Print the bookmarks on heavy card stock. Optional: Laminate the bookmarks for added durability. Cut out the bookmarks with scissors or a paper trimmer (recommended for best results). Optional: Punch a hole in the top of the bookmark and add a tassel. You may print the bookmarks for personal and classroom use. You may not sell or distribute the files for the bookmarks or printouts of the bookmarks.